Optometrist, Erna Takazawa, has been named the University of Auckland 2017 Young Alumna of the Year for her work developing optometry in Samoa and leading improvement of eye care in the Pacific. She will join the University of Auckland Distinguished Alumni at the ‘Bright Lights’ panel discussion event on Thursday evening and the awards dinner on Friday (10 March). 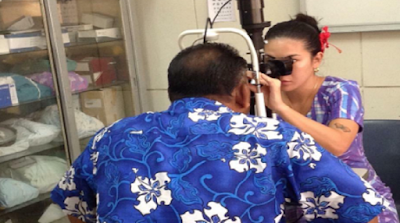 When Erna graduated from the University of Auckland in 2012 with a Bachelor in Optometry, she returned to Samoa as the only optometrist and worked with a team of eye nurses looking after the country's eye problems. She relied on overseas visiting teams and the government overseas treatment schemes to New Zealand for specialist surgeries as at that time they had no ophthalmologist. “I am still the only optometrist on the island, but at least we have an ophthalmologist now who can do common eye surgeries (cataracts and pytergium surgeries) and look after things while I am out of the country,” she says. Earlier this month, she was in Fiji to teach the essential eye course for Pacific nurses specialising in eye care. Later on she will fly back to provide clinical supervision to ensure the students are well-equipped with proper eye skills before they go back to their home countries to practice. Erna says she would like to spend more time teaching but is needed at home in Samoa where she is still the only optometrist. In Samoa, Erna sees patients daily and helps to solve their visual needs. “I also go on community outreaches to rural areas of Samoa and the other island Savaii, taking eye care (free glasses and medication) to the people who cannot come to the main hospital in town where my clinic is based,” she says. She also works at the Samoa National Health Services as National Eye Health Coordinator, to coordinate visiting eye teams, liaise with overseas donors on Samoa’s needs, as well as attending meetings. Last year, Erna was also selected by the Samoan government to be a Council member of Samoa's Allied Health Council for a three year term. In 2015 she was named Samoa's first-ever Queen’s Young Leader Award winner and is the only winner from Samoa. “I am on the Queen's Young Leaders' advisory panel and our role is to help short-list and select the next 60 award winners from different parts of the Commonwealth, so I fly to London for the selection meeting,” she says. She is also a panellist on the Queen's Young Leaders Legacy panel that reviews grant proposals and gives out grants on projects that fit the values of the Queen's Young Leaders program to make an impact.